IODP (International Ocean Discovery Program)*1 Expedition 370, “T-Limit of the Deep Biosphere off Muroto” *2 will take place aboard the Japan Agency for Marine-Earth Science and Technology (JAMSTEC: Asahiko Taira, President) D/V Chikyu from September 10 to November 10, 2016. The IODP T-Limit project aims to: (1) study the factors that control biomass activity and diversity of microbial communities in a subseafloor environment where temperatures increase from ~30°C to 130°C and thus likely encompasses the biotic-abiotic transition zone, and (2) determine the geochemical, geophysical and hydrogeological characteristics in sediments and the underlying basaltic basement, and elucidate if the supply of fluids containing thermogenic and/or geogenic nutrients and energy substrates may support subseafloor microbial communities in the Nankai accretionary complex. Core samples will be drilled and retrieved from sedimentary sections, 300–1190 m below seafloor and basement basalt, 1190–1240 m below seafloor. 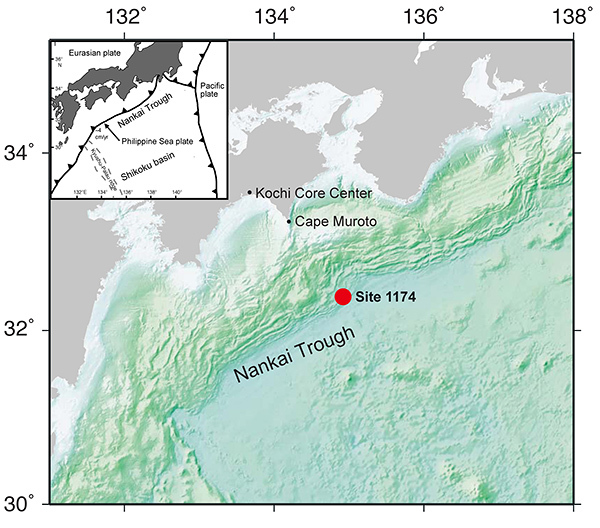 To take full advantage of the scientific technology available today, the scientific work program onboard Chikyu will be complemented by simultaneous shore-based work at the Kochi Core Center*3, located within reach of Chikyu via helicopter shuttle for transporting freshly cored sediment and rock samples. Co-chief Scientists Drs. Fumio Inagaki, JAMSTEC and Verena Heuer, University of Bremen will lead the shipboard team, and Yuki Morono, JAMSTEC, the shore-based team. A total of 28 scientists from 8 countries will also participate in the project. *1 The International Ocean Discovery Program (IODP) is an international marine research collaboration that explores Earth's history and dynamics using ocean-going research platforms to recover data recorded in seafloor sediments and rocks and to monitor subseafloor environments. IODP depends on facilities funded by three platform providers with financial contributions from five additional partner agencies. Together, these entities represent 25 nations whose scientists are selected to staff IODP research expeditions conducted throughout the world's oceans. Scientist activities are managed by the IODP Program Member Offices (iodp.org/about-iodp). “T” here refers to temperature. *3 The Kochi Core Center is a research facility jointly managed by the Kochi University and JAMSTEC. It is one of three IODP core repositories in the world, including the Gulf Coast Repository of the Texas A&M University in the US and the Bremen Core Repository of the University of Bremen in Germany. Figure 2: Conceptual diagram of the borehole temperature observatory.